My daughter has always had a very early bedtime. It was 6PM for the first year of her life and around 7 PM for the second two years. It’s a sanity saver because it ensures that my husband and I get some time together—but it usually means we need a snack before bed since we eat dinner at 5 or 5:30. This frozen yogurt cake is a favorite recent late night treat, and it’s become the dessert that I turn to when we need something special to share with friends. “Treat” is actually a strong word for this cake since it’s primarily plain yogurt and fruit. But with lemon juice, a little honey, and a sprinkling of graham cracker crumbs in the middle, it’s both pretty and delicious. And it’s a really refreshing way to end a hot summer day. It’s really easy to put this dessert together without any special appliances or equipment, with the help of parchment paper, plastic wrap, and a standard loaf pan. It comes together in less than ten minutes and, after a few hours in the freezer, it’s ready to slice and enjoy. I’ve made two different versions of this recently—one that my husband and I ate while watching Netflix and another that we shared with our three year old and our neighbor for his birthday—and everyone enjoyed it. It’s bright and summery, but it’s far from fussy. 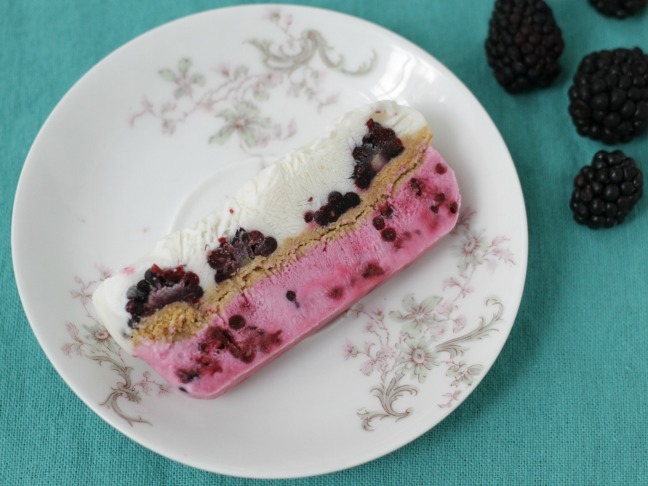 I’m pretty sure it’s going to be our go-to company dessert for the rest of the summer…assuming that my husband and I are nice enough to share it! I used blackberries since they looked the best at my market, though raspberries, blueberries, or diced strawberries would be just as delicious. And you could even change up the plain graham cracker crumbs and use chocolate ones instead, or even try crushed vanilla wafers or a gluten-free cookie. Play around with the flavors and see what you and your family like best, or customize it for the occasion! 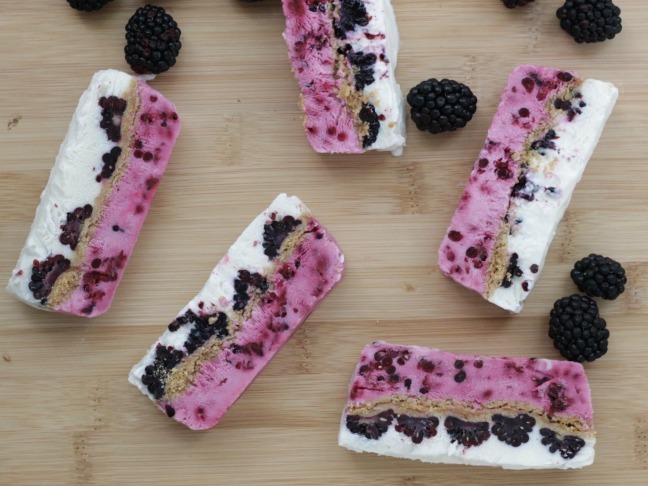 This frozen treat is healthy enough for baby to enjoy with you. Step 1: Line a loaf pan with parchment or wax paper, leaving two inches overhanging on each side. Line completely with plastic wrap, using two pieces if necessary. Set aside. Step 2: Place ½ cup blackberries into a heat-proof cup or dish and warm for 30 seconds in the microwave. Mash well with a fork and set aside to let cool slightly. Step 3: Stir together the yogurt, honey, lemon juice, and vanilla in a medium bowl. Divide in half, placing half into a separate small bowl. Stir the mashed berries into one half of the yogurt, then pour into the prepared loaf pan, shaking slightly to make it even. Step 4: Sprinkle the graham cracker crumbs evenly over the first yogurt layer. Halve the remaining blackberries and place on top. 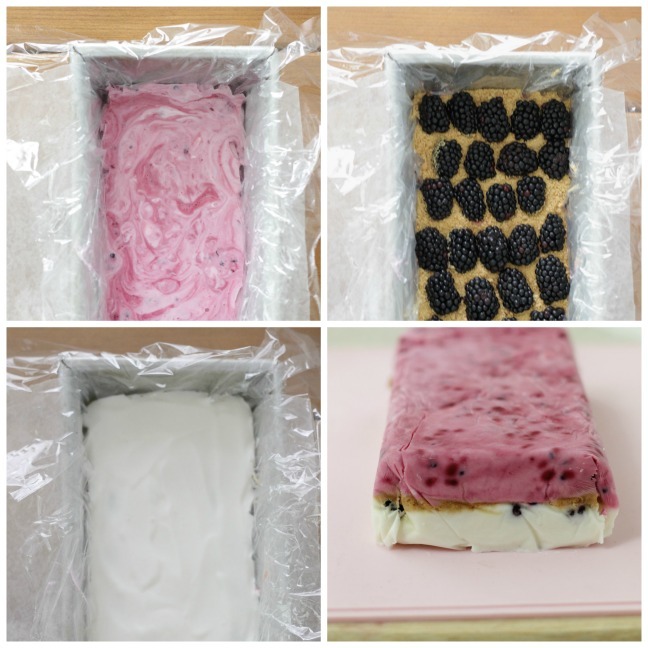 Cover with the remaining yogurt mixture, then cover with additional plastic wrap to seal. Place into the freezer for 4–5 hours. Step 5: To serve, lift the loaf out with the parchment or wax paper and remove the plastic wrap. Place onto a platter or cutting board and slice carefully. Serve immediately. (If the cake stays in the freezer longer than 4–5 hours, let sit at room temperature for about 15–20 minutes before slicing or serving.) Store any leftovers in the freezer in an airtight container for up to a week.